No training sessions lately, so no blogs have been posted. I’m going to the barn 4-5 days a week and hand walking Wizard, but other than that, he had a break from any long line work. And he has not been ridden since October (STILL waiting for our saddle). I can’t complain about the weather- we have had some pretty good cold snaps, but no major snowstorms. Wizard is doing quite well in his new blanketing system- I use a Rambo with a hood as the shell and use the Horseware liner system underneath. The liners are machine washable and come in a variety of weights. In the morning, I took Wizard on a hand walk with Kris and Sunny. We did a little more hill work than usual, walking up and down the steeper trail on the big hill in the “bowling pin” field. We were out for about 40 minutes. When we returned to the barn, I tacked up Wizard and did some long line work. I started out by walking him with the lines attached to the cavesson rings. He was already nice and loose from the trail walk, so we then trotted on a loose line until his tempo was even. Gradually, I asked for some shortenings and lengthenings at the trot. He exceeded my expectations, and was able to get himself into quite a small trot and then really stretch out into a big trot. At the end of the short session, I clipped the lines to his bit and let him canter just a few rotations in each direction. For having so much time off from ring work, his canter actually looked quite nice. It was fairly balanced and he was not tipping nearly as much as he does on a regular longe line. The session was just the perfect amount of work- Wizard got just a little sweaty, but did not go around for too many rotations. I’m still mindful of whatever was going on with his right front foot this fall/winter. Before work, Wizard and I walked in the park with Christie and Brigid. We were out a little longer, maybe 45-50 minutes. There was a little bit of snow on the ground. Wizard has snow rim pads on his front feet, but nothing on his hind shoes, so they unfortunately balled up with snow. Fortunately, I carried a hoof pick and was able to keep him comfortable for the walk. We walked behind Brigid for the entire walk. This was excellent schooling for Wizard, who likes to be on the lead most of the time. He was pretty content being in the back. We walked up the hill, through a wooded path, down to the road, and back up through the back set of fields. 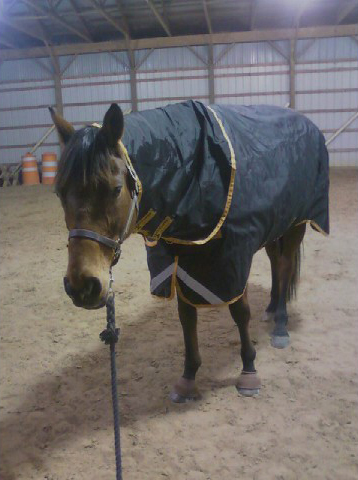 After our walk, I did another session of long line schooling in the indoor arena. The session was similar to Saturday’s, but with a little more stretching and some more walk-trot transitions. I clipped the lines to the bit again for canter work, and asked for some stretchy trot work after the canter. He still fiddles with the bit, but I think his connection is getting smoother and smoother. I’m counting down the days til the saddle arrives, but in the meantime, we’re having fun.